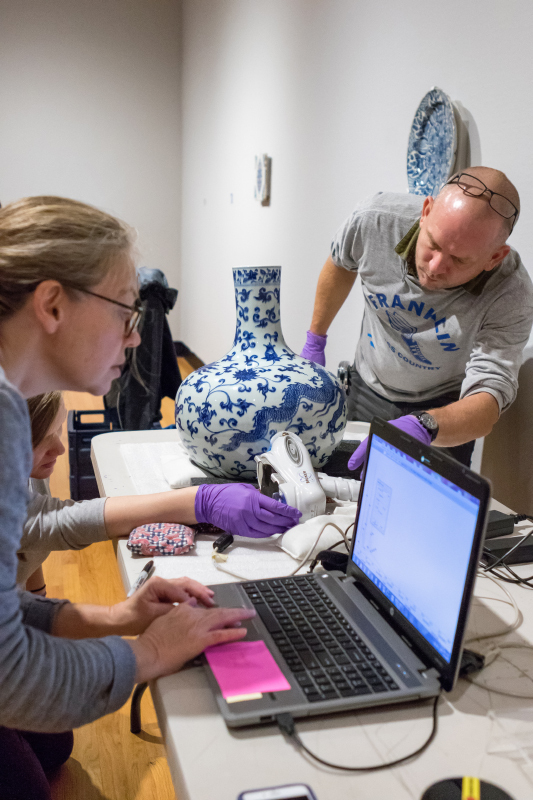 Krannert Art Museum is using energy-dispersive X-ray fluorescence technology – with the help of the Illinois State Geological Survey and the Illinois State Archaeological Survey – to help determine the age of an antique Chinese porcelain vase in its collection. Museum officials hope to learn whether the vase is from the Ming Dynasty or a later time period. CHAMPAIGN, Ill. — I hold my breath as Walter Wilson, one of our technicians, carefully moves an antique Chinese porcelain vase from its pedestal at Krannert Art Museum to a nearby table. Now, it sits next to an electronic scanning tool and a laptop computer. Wilson positions the vase on its side, using bean bags to support it and hold it in place. KAM curator Maureen Warren takes a close look at the vase. Its color and the brush strokes used can also help determine when the vase was made. 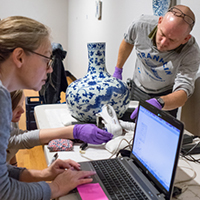 The vase is the centerpiece in a new exhibition, “Blue and White Ceramics: An Enduring Global Obsession,” that I’ve prepared. With the help of these scientists at the University of Illinois, I’m taking the opportunity to discover more about its age. Krannert Art Museum purchased the vase in the early 1960s with money from the Class of 1908, given on the occasion of its 50th anniversary. The vase is 17.5 inches tall, with a shape and pattern – a backward-facing dragon surrounded by lotus flowers – reminiscent of vases made in the Ming Dynasty that were given as diplomatic gifts from the emperor. These vases are among the most refined expressions of Chinese artistry. 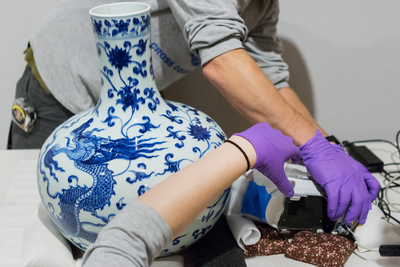 Scientists used a hand-held scanning tool to scan several areas on the vase’s surface. Its size, shape and pattern featuring a backward-facing dragon surrounded by lotus flowers are consistent with vases produced during the Ming Dynasty. KAM’s dragon vase may be from the Ming Dynasty (A.D. 1368-1644) or from the later Qing Dynasty (A.D. 1644-1912). To help determine its age, I’ve asked the Illinois State Geological Survey and the Illinois State Archaeological Survey to assist me in using some of their equipment to scan the vase for the presence of different elements. Chinese potters used both imported and local cobalt to produce the blue color that decorates their porcelain. They obtained the cobalt from different sources over the centuries, and each contains different mineral impurities. Determining the mineral impurities that are present in our vase can give us a more accurate idea of the window of time in which it was made. Madeleine Evans, a senior lithic analyst at ISAS (at computer), and Walter Wilson, a design and installation specialist at KAM, position the vase so the X-ray fluorescence device can scan an area on the vase. This summer, Morgan Bailey, a geochemist at the ISGS, used energy-dispersive X-ray fluorescence spectroscopy to scan a small tea caddy that we know came from the Qing Dynasty. The instrument bombards the surface of an object with an X-ray beam. 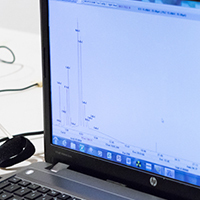 By measuring the energy emitted, it creates a spectrum showing the different elements that are present – like a fingerprint for that object. 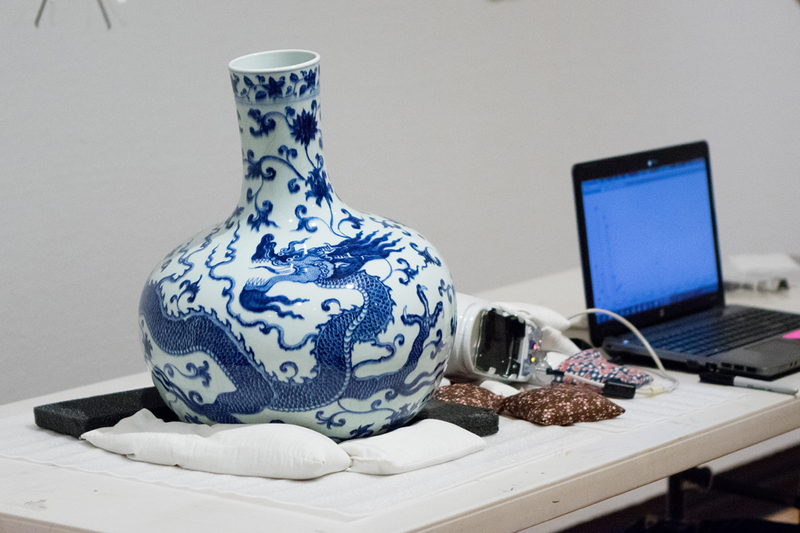 The dragon vase is too large to fit inside the instrument, so we examine it with a hand-held X-ray fluorescence tool provided by ISAS and calibrated for accuracy. Madeleine Evans, a senior lithic analyst at ISAS, and Bailey aim the scanner at an area of blue glaze. They scan the vase in four places. 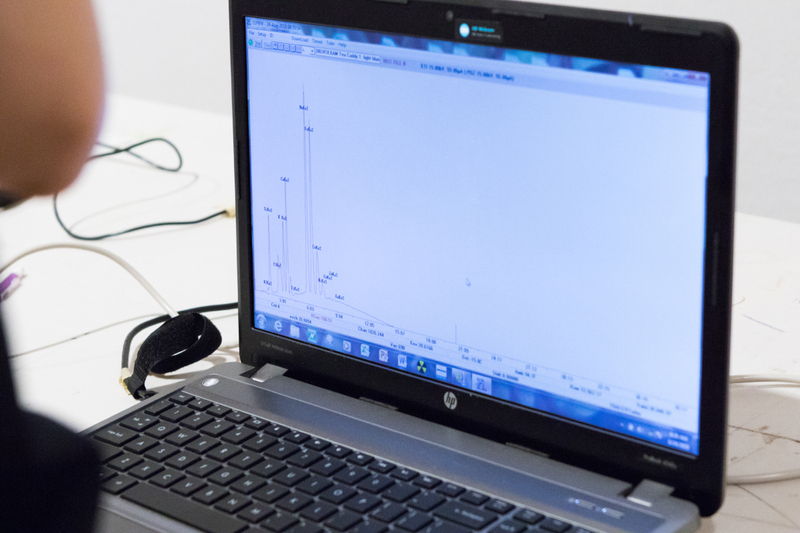 Later, an expert will analyze the spectra we get from the scans. The scan of the vase creates a spectrum showing the different elements that are present. Looking at what impurities are present in the cobalt used to decorate the vase will help determine its age. Just looking at the porcelain vase and noting the subtle differences in the shades of blue, as well as the manner in which it was painted, will also help to determine when it was made. The blue in porcelain from the Ming Dynasty often looks blotchy because the cobalt clumped together, making dark spots that penetrate the surface of the glaze. Porcelain made in the later Qing Dynasty often has a brighter blue hue, and modern porcelain can have a vivid, perfectly even blue color. 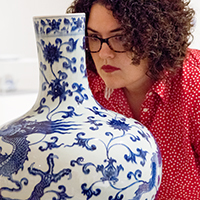 Stacey Pierson, an internationally renowned expert in Chinese porcelain, will visit the museum for a Feb. 15 lecture. She will examine this vase then, looking at its color and brush strokes to help determine when it was made. 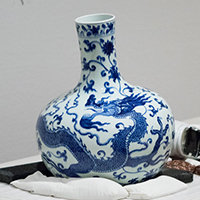 Even if we learn the dragon vase is not from the Ming Dynasty, it’s still an incredibly fine piece of Chinese porcelain, made by Chinese artists who revered and knew much about the Ming dynasty. 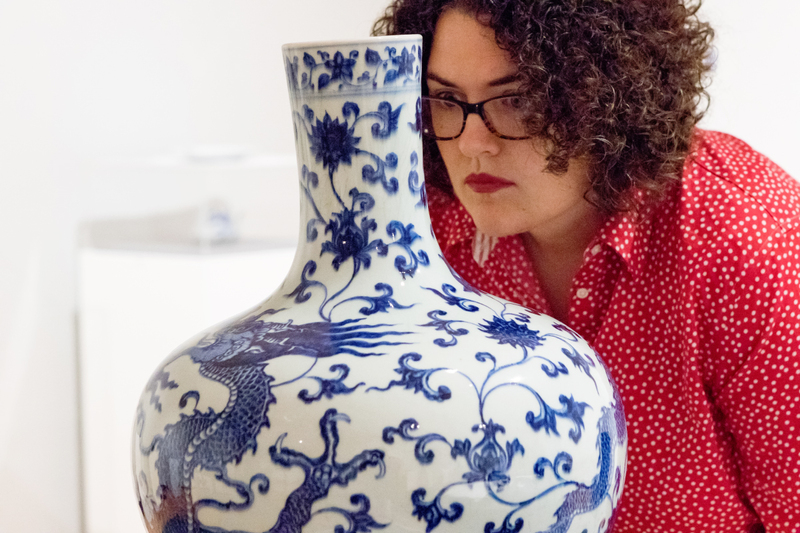 Visitors to Krannert Art Museum can see the dragon vase in the “Blue and White Ceramics” exhibition through May 12.